At Dumond’s Custom Furniture, we’re proud to say that each piece of our custom wood furniture is meticulously hand crafted right here in the USA. Using beautiful and unique hand selected wood slabs from around the world, we build reclaimed kitchen islands like nothing you’ve seen before. 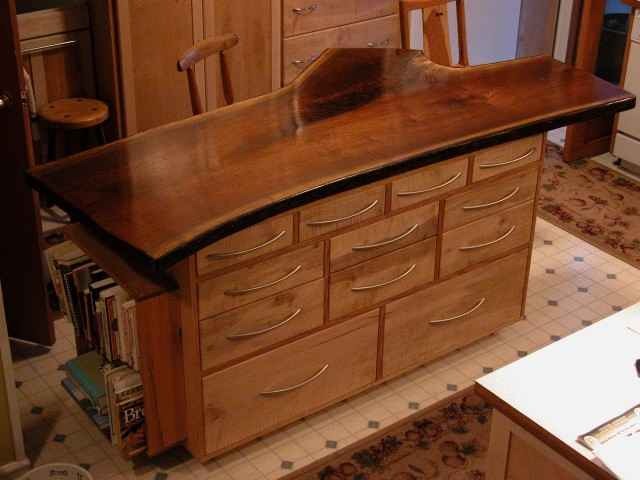 Whether you decide to order one of the custom natural edge kitchen islands for sale below or you decide to have a custom piece made to fit your personal style, you can rest assured knowing that your new furniture is built to stand the test of time. Beautiful custom Walnut kitchen island and curly Maple kitchen island. This unit features cookbook holder on the end, 2 place settings for bar stools, and 12 deep drawers with brushed nickel pulls. Enough room for pots and pans, casserole dishes, bake ware and flatware drawers. Custom kitchen islands built in walnut, cherry, and maple. Size 29 / 39″ W X 36″ X 7′ L.
Cherry Kitchen Island with Cherry Slab top, maple base. Custom kitchen islands made to order from unique wood slabs. Size 53″ W X 36″H X 8′ L.
If you’re looking for a custom built kitchen island to fit your home or cabin, we can help you out! Let’s say you already have an idea in mind of a custom natural edge kitchen island that you would like to have. You can submit your idea to us via our Request A Quote Form or call us directly at (406) 777-3772. Just describe the type of kitchen island you’re looking for, the size, shape, wood type, and any examples that you might have and we can give you a custom quote. From there, it takes a few weeks to build the kitchen island itself by hand but once it’s complete, it will be shipped to your doorstep within a few weeks.